A man who lost use of his legs to childhood polio defied heavy snow to drag himself up Mount Tai in Shandong province by his hands. 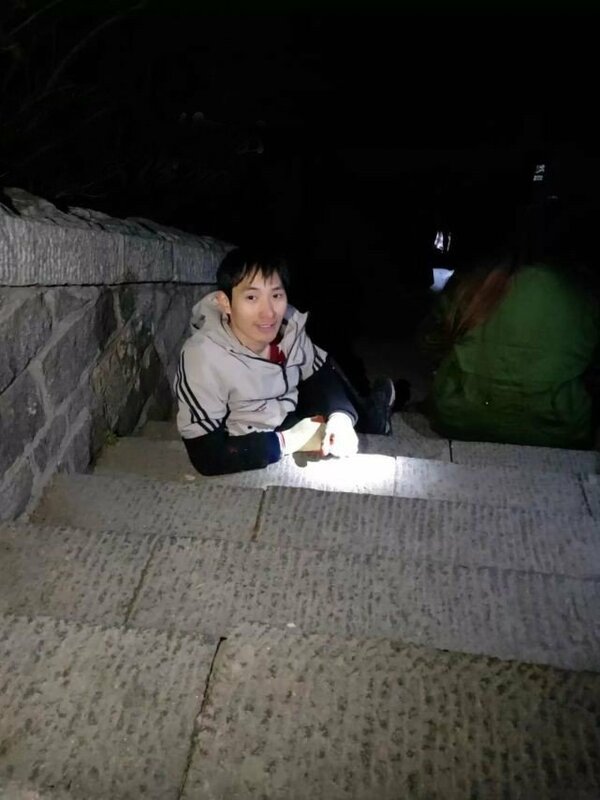 Wang Cunwei, 33, of Feng county in Jiangsu province, started his 23-hour climb up the steps of one of the Five Great Mountains of China on Wednesday to “show we disabled people can achieve what healthy people can”, the Metropolis Morning News reported. With support from his family, Wang prepared 12 pairs of gloves, four sets of knee pads and dozens of warming pads before setting off from the Red Gate, the foot of an ancient winding path up Mount Tai, at 9:30am accompanied by three relatives. The bluestone path was a challenge for Wang, who had to rest after climbing a few dozen metres. It took him eight hours to reach a scenic viewpoint most visitors typically reach in an hour. Wang spent the night climbing the mountain, his trousers and shoes were frayed and his hair was soaked with sweat. In the morning, it began to snow. Others visitors rented heavy overcoats to ward off the cold, but Wang could not because it would make his ascent more difficult. A tourist, impressed by Wang’s determination, took off his down jacket and gave it to the climber. “I felt much warmer afterwards, but then the coat became very heavy because of the snow,” Wang was quoted as saying. “I had to take it off again to be light for climbing. When he reached the South Gate to Heaven, the highest point on the mountain, after climbing more than 1,500 metres, his trousers were worn out at the knees, bottom and waist and his elbows were swollen from the effort. “We need to take a good rest after no rest for one day and one night,” he was quoted as saying. The father of two, who is married to a kindergarten teacher, runs a China Mobile shop in Feng county.